The Los Angeles Department of Water and Power recently announced a plan to use Hoover Dam, along with solar and wind energy, to help generate electricity during peak demand times, but its effect on Boulder City is still unknown. File The Los Angeles Department of Water and Power is researching a plan that would use Hoover Dam's generators to create additional power during peak demand times. 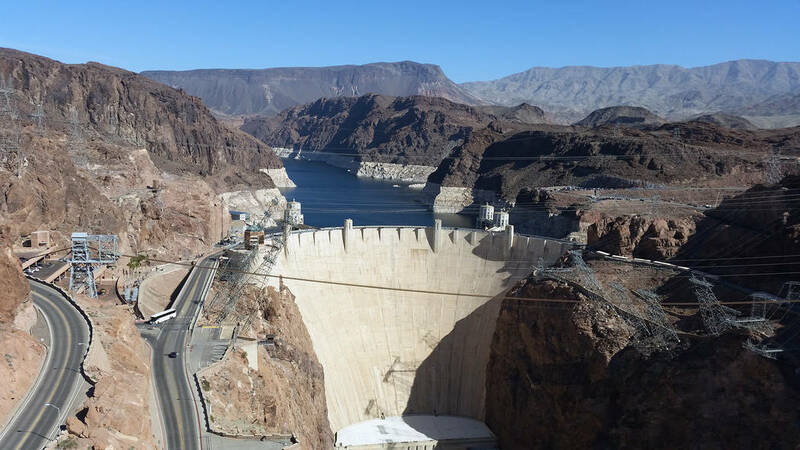 Recently, LADWP said it was researching the possibility of installing a $3 billion pipeline and pump station downstream of Hoover Dam. Both would be solar- and wind-powered and would help regulate water flow through the dam’s generators. The pump station would send water back to Lake Mead to be stored for future passage through the power-generating turbines, helping manage electricity during peak demand times. This essentially would turn the lake and dam into a large storage facility for extra energy. Reiko Kerr, senior assistant general manager of the LADWP’s power system, said the idea for the project came up about a year and a half ago. She sees it as a way for the dam to again help society progress. “It’s a huge solution. … Now we’re using that really old technology to again bridge to the future,” she said. The project is in the initial phase; the next step is to see what challenges need to be overcome. Kerr said the locations of the pipeline and pump station need to be determined. “We need to figure out where to go to have the least impact,” she said. Kerr said some of the next steps would be to perform a hydraulic impact study and a geological analysis, as well as getting more detailed engineering plans for where the pipeline and pump station could go. It will also look to see if there are any insurmountable challenges ahead. Additionally, the LADWP would need to have meetings with communities that would be affected to determine their concerns, how to mitigate them and how best to partner with them. A funding source also needs to be found. “We need to jump through all the other hurdles first,” Kerr said. She said a reasonable estimate for when this project could start is 2028. “Until we get in and look at it, we really don’t know,” she said.